A good point and shoot camera won’t cut it for everyone. This is especially true for those looking to take their photography to the next level, or want to put their foot into the world of professional photography. That being said, we will be reviewing what seem to be three of the best DSLR cameras under 50000 on the market. They seem to be great options for those looking to get a feel of professional photography, and the first (and more expensive) option may even be ideal for it to a certain extent. First things first, just because something worked for someone doesn’t mean that will work for you too. It seems that too many people end up going with a product their friends have bought. While there may be nothing wrong with this approach, when it comes to something like photography, everyone’s needs may differ, at least slightly, from one another. Hence, you may want to take a look at the features and figure out what would work best for YOU. With that said, here are our top three DSLRs priced under 50000. The Canon EOS 200D is one of the latest DSLRs under 50000 to have hit the market, and boy has it took the market by storm. While we previously put the Canon EOS 750D as the best DSLR camera under 5000 in India, we now have to let it slip to the second spot and give the grand title to the 200D beast. It boasts some of the most advanced technology, despite being considerably cheaper than the 750D. Its most highlighting feature is the Dual Pixel CMOS Autofocus, which is probably as good as it can get for a DSLR available in India. The autofocus is indeed insanely good and works like magic, especially in the Live View mode. You will find that it never misses the right subject or elements to focus on, no matter how fast-moving they are or if you’re trying to shoot some intense action video. If you want to set the focus manually, you can do it pretty quickly as well, thanks to the highly responsive touchscreen. And talking about the touchscreen, it’s an articulating touchscreen which gives you a lot of flexibility with respect to the angles you can shoot your videos in. The DIGIC 7 image processor is snappy and powerful, and the images it manages to take come out perfectly detailed and sharp. The video quality leaves nothing to be desired either, as the 200D takes stunning footage at 1080/60p quality. There’s no shortage of connectivity options, too, as the 200D supports WiFi, NFC and Bluetooth, but without being too demanding for the battery life. This helps the 200D have an impressive battery life despite all its advanced features. And the same goes for its size and weight as well. Although it’s one of the most advanced DSLR camera in India — and perhaps the most advanced DSLR under 50000 — it’s surprisingly compact and lightweight. In fact, it’s the most lightweight DSLR in the world with an articulating touchscreen. The controls are pretty ease to get familiar with, and the buttons are located just at the right places. This also makes the 200D much more beginner-friendly than you would expect such an advanced DSLR to be. 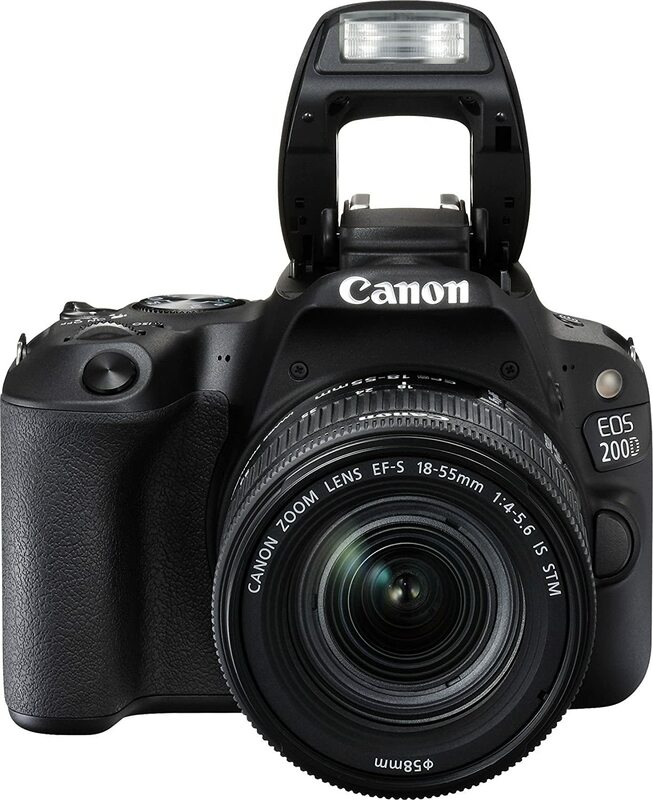 Finally, the Canon EOS 200D sold in India also comes with many useful accessories like a 16GB memory card, great quality lens, free camera case and more. Needless to say, you’re getting an amazing value here. This is a beast. There’s probably no other way to put it. Oh, and yes, it also exactly isn’t a DSLR under 50000, but costs just a little more than that so we decided to let it in on this list anyway. But for a good reason, of course. it’s not one of those average DSLRs that will just be good enough to take some great shots and be serve well for hobby photography. It’s for serious photographers, usually the professionals out there who can’t settle for just anything. Coming to the image quality, we are finding it hard to describe it. The images probably look better than reality itself, which is definitely saying something. They are not only crystal clear, but they are amazingly vibrant and look so real-like. It’s also relatively compact and light, especially for a professional DSLR, and comes with tons of advanced features such as WiFi, built-in intervalometer, amazingly fast autofocus and more. Perhaps the only downside is limited manual controls. But to be fair, who would want that with so many other features to more than make up for it? The battery life is just as impressive, too. If you can’t take damn good pictures with this DSLR, then photography probably isn’t for you. 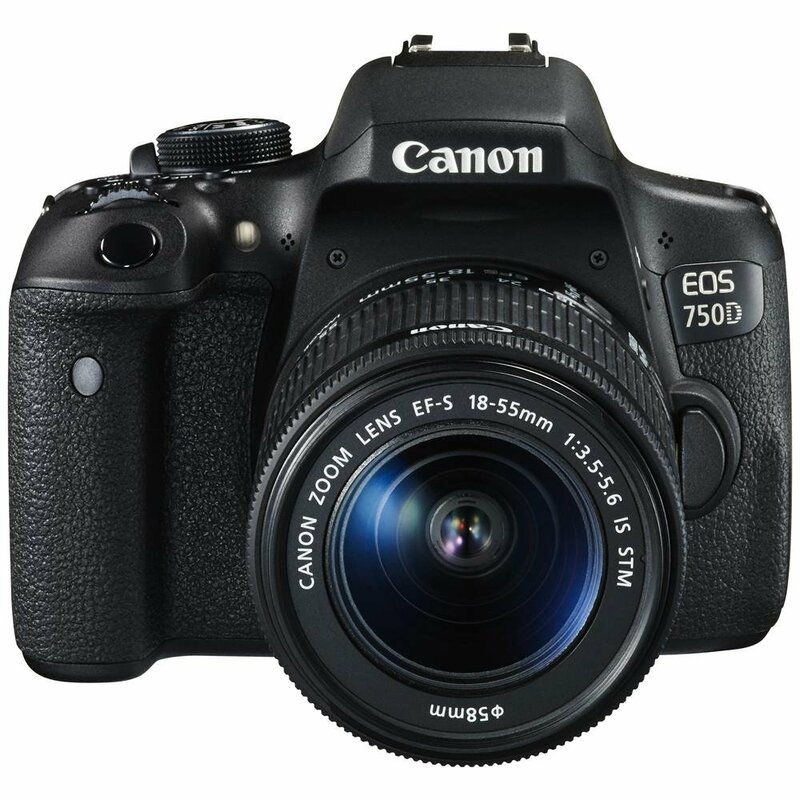 If you’re a beginner at DSLR photography, the Canon EOS 750D is probably your best bet. There’s a steep learning curve to DSLR photography, but you can make it considerably simple with this machine. It offers a great level of ease of use, and most beginners shouldn’t have much problem taking great shots. It also shoots reasonably good videos, and is perfect for daily use. 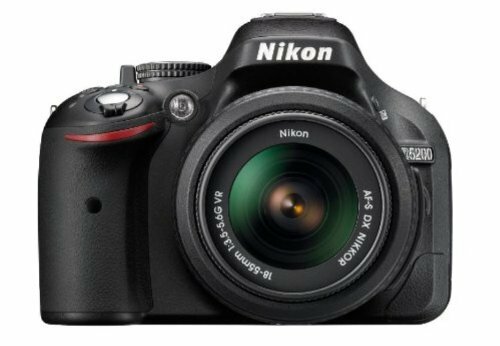 However, don’t expect it to give out pictures of the quality the Nikon D5300 (the product mentioned above) is capable of producing, simply because it’s designed to be a more beginner-friendly DSLR than a professional one. Also, if you find the Canon EOS 750D to be priced on the higher side, you can check out its slightly less impressive version which is also one of the best DSLR cameras you would find under 30,000. Canon and Nikon totally dominate the high-end DSLR segment, with the Nikon D5600 being one of the latest DSLRs to hit the market and add to the dominance of Nikon in this segment. Some features that set it apart from most of the competing products include amazingly detailed shots and videos, being able to capture split-second moments fairly easily (even if you’re not a professional), great focus response and many other advanced features. Surprisingly, however, it actually manages to be a perfect beginner DSLR despite all its advanced features. If you’re looking to break into professional photography and want to make things easier for yourself, then the Nikon D5600 is exactly what you’re looking for. It’s also pretty lightweight, and the menus are easy to understand and navigate. The grip is great, and the handling is just as easy. Overall, it couldn’t get easier for a beginner while still getting access to a wide range of advanced, professional DSLR features. This is a value pick among the DSLRs priced in the range of 40000 to 50000. It boasts pretty much the same features as the Canon DSLR mentioned above. Now that’s saying something, as the latter is priced considerably higher. As one of the customers who purchased this product mentions in their review, you would love absolutely everything you click with this DSLR. The unique flip out screen feature it comes with is particularly impressive, especially in this price range. And though it might seem that being a Nikon DSLR, it may not offer the ease of use as the Canon ones do, you may be proved wrong. You may not take more than a couple days to get used to this DSLR, especially if you’re a bit experienced with photography. Some of the highlighting features of the Nikon D5200 include great low light sensitivity, great indoor performance and impressive shutter speed. Finally, if budget isn’t a constraint for you, you may want to take a look at our ultimate guide to the best DSLR camera in India.